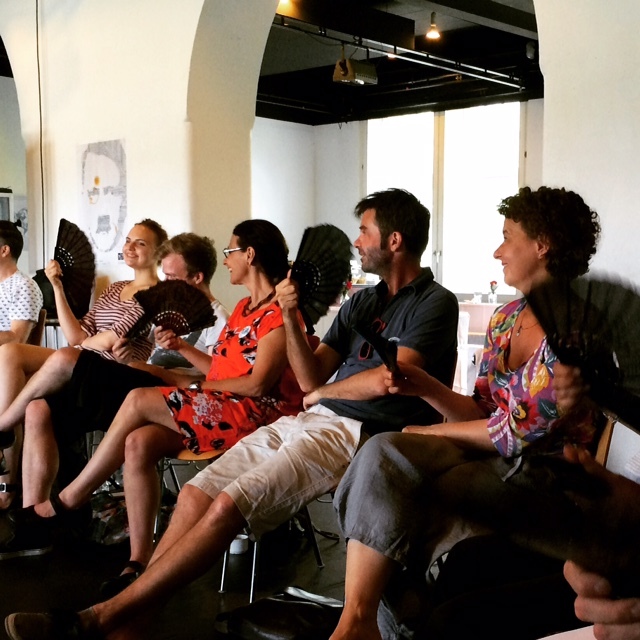 Notes on ASSITEJ director’s seminar: sharing & reflection. | Everything is art/work. The Assitej Director’s Seminar in Mannheim was a privilege. At a point where I was feeling pretty burnt out and doubting my skills as an artist – this opportunity was a week triggering reflection on Australia’s children’s theatre context and my own artistic practice. 27 artists from Bangladesh, Sri Lanka, Turkey, South Africa, Kenya, Switzerland, Germany, Spain, Mexico, Italy, China, England, Japan, South Korea, Estonia, Vietnam, Israel, USA, Serbia, Brazil and me, from Australia. Schnawwl (pronounced Shnavel, a colloquial word for a beak, possibly a nosey one) are part of the National Theatre of Mannheim. 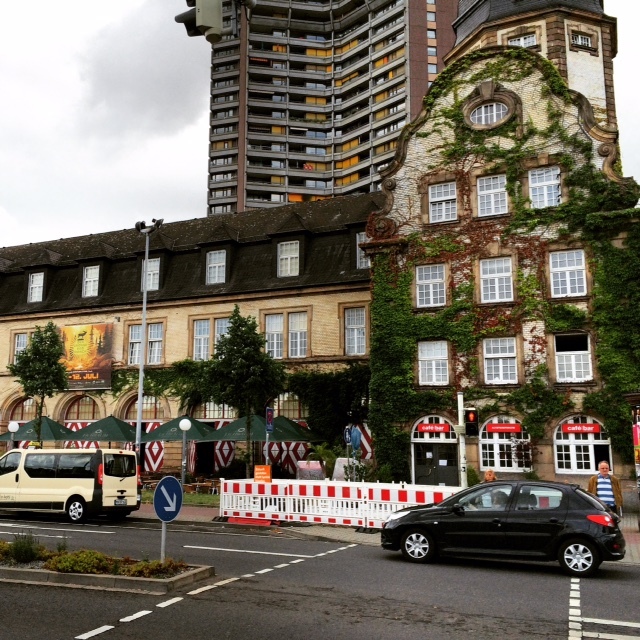 Mannheim has a population of about 300,000. The National Theatre of Mannheim has 4 arms: opera, theatre, ballet and children’s theatre (Schnawwl). While opera is the largest part, each sector has an equal footing in management and decision making. Schnawwl has its own building that has its own theatre. (Approx. size of the tower theatre, Malthouse.) They have a staff of about 30 full-time staff which includes 6 fulltime actors, an AD, Dramaturg, Costume Designer, Costume maker, Set Designer, tech staff and more. So comparatively it’s about the same size as Malthouse – but their staffing is skewed more to the artistic than the marketing/admin/sponsorship. They have about six shows in repertoire at any one time, and they range from works for aged 2 to 16(ish) years and vary from opera, dance, music, puppetry to scripted plays and are also developing works with young-people too, which they call “Citizen’s Theatre”. Schnawwl’s work is high quality and it was quite a diverse repertoire, yet all in-theatre work. Some of the works I loved, some I didn’t. But as always, I liked them more when I understood the context around their selection. It was apparent that they were very very clear about the choices they made and had excellent discourse around the why’s and dramaturgy of work. The role of the dramaturg is used, but not often in Australia. Let alone in the children’s theatre context. I hadn’t realised before this experience what the dramaturg was exactly responsible for in an organisation context. I was fortunate enough to be in Schnawwl’s dramaturg’s group, and got to understand her role a bit further. Essentially, she is responsible for providing the wider context for the organisation. To read lots of scripts, books and consider social and theatre trends when selecting what works the company will do. She proposes the works, then in discussion with the AD and directors they narrow the selection down. They are also responsible for the writing around the work – the marketing per se. They are also heavily involved in the rehearsal room – as a bouncing ball for the director and a contributor of material and ideas. They are trained in the art of storytelling and are across structures/tropes and devices. It’s kind of like they continually have one eye on “the bigger picture” of the audience and the world at large. That’s how I perceived it anyway. I actually came away from Schnawwl thinking that I actually am innately more a dramaturg than a director/maker. That the underpinning question “What Does the World Need to Hear?” of Maybe ( ) Together was innately dramaturgical. I have always enjoyed the conceiving process & rehearsal room more than anything in making art. Which has been frustrating in the last three years of running Maybe ( ) Together as I spend a disproportionate time making to in front of the computer, co-ordinating and pitching. 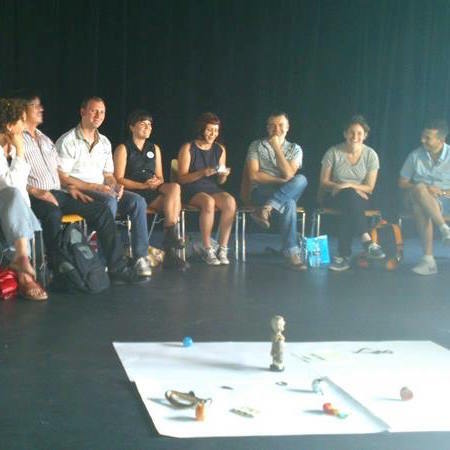 While our sector would benefit from dramaturgy – I also know that this is a “luxury” in our sector at the moment. However, having had one on my last project – if I make/direct/perform/produce a show ever again I know that this is an excellent investment in my sanity. With the lack of funds it is common for the initiator/creator to take on two or three roles. This isn’t sustainable. Some out-source the producing side of things, but I think a dramaturg might be an even better investment. So, dear Australia, I am putting my hand up. What did we do at the Seminar? Our theme was Progress. And as lefty, artist we are all too aware of the “hot topics” in our world at the moment: neoconservatism, refugees, war. Spurred by the comment “ how can we progress as a human race?”, Schnaawl selected a book as an starting point for discussion and generation of material. 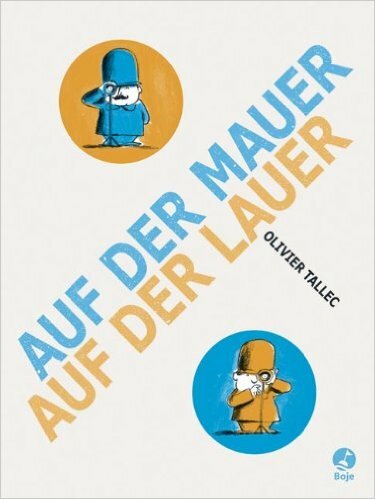 I think we all fell in love with Auf der Mauer Auf der Lauer by Olivier Talec and found it a rich place to find ideas with layers found in the imagery. We split into three groups and were told we could do whatever we wanted with that time as a group: develop material, discuss our country’s context & our work, share material – it was up to us. We spent a lot of time talking. 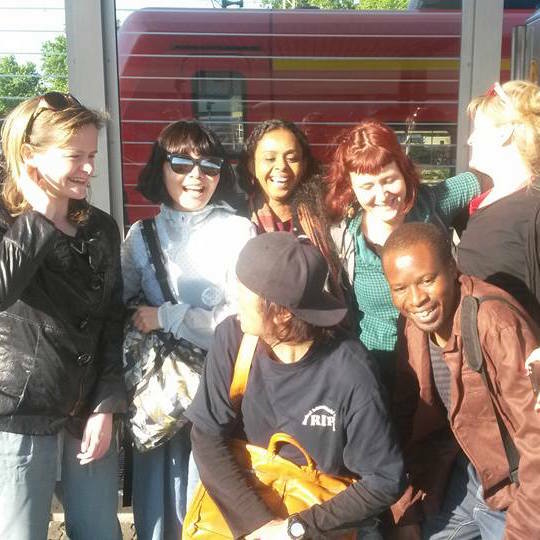 And as the native English speaker I soon stepped into a role of facilitator. This was a really interesting position for me – realising that I was privileged in this situation and had a responsibility to re-word statements and ensure everyone had space to talk. You also learn very quickly to limit your vocabulary. And how much gesture and words together can communicate complex ideas. Privilege is something that is talked about a lot in Melbourne. White cis male privilege particularly. Although a microcosm – it was valuable for this to be plainly evident and how I navigated it. Simply, it was rewarding and valued my methods of facilitating. Which was a valuable reminder that I am a good facilitator. Something I’d forgotten. Personally, I am in a space of despair within Australia’s political climate. Fatigued and despondent, it’s good to be away for a while. Australia’s story is not uncommon, though. There are concerns in Brazil, in Denmark, all over Europe about the rise of conservatism. About the silo’s of information that occur between factions. How much yelling there is. How little conversation and progress is achieved. Auf der Mauer Auf der Lauer put us on the track of conversation. In the book two men (one blue, one orange) are suspicious of each other. Surveillance turns into fighting. Anything blue is hated by the orange man, anything orange hated by the blue man. The climax of the book is when a bird of blue and orange colours is born. The two men want to shoot eachother. But it is this little bird of blue and orange that stops them both from shooting – by standing between them to protect them both. For me this blue and orange bird is a child they share. Or metaphorically a shift in perception to the bigger picture. As a group we agreed this is what needed to happen everywhere. How to move from the yelling stage to the bigger perspective. This is something I’ve been pondering on for over a year, so it was serendipitous that it came out again. I think having 7 artists from all over the world discuss this was a powerful moment for all of us. Schnawwl’s “Citizens theatre”, ie youth led work is a two year commitment for the group selected. They young people are not paid for rehearsals or training, but are paid 20 euro per performance to cover travel and food. There was a really interesting discussion about exploring gender with young people through art. Particularly as many might not know what their preferences are as yet. Schnawwl decided that they would only work with the stories the young people brought up, and no homosexual/trans material appeared. I think this is an interesting thing to consider. One of Schnawwls’s works I found quite un-inspiring though well presented. Essentially a scripted comedy about two twins and their first day of school. It seemed quite different to all their other works in its simplicity. Schawwl felt it was important, though, to have a work where children saw “their” story on stage. As in, the first day of school might not be important to adults, but was a big moment for children. One of their works was a touring in-school jazz opera about divorced parents. And it was great. I think these are the most useful points I can share. There were other anecdotes, connections and moments but these are the ones most useful to others, I hope. It’s difficult, I realise, to think beyond the current climate in Australia and the funds-emergency pending. However, I hope this provides a spark for some, however small. To any other theatre directors working with/for children this conference occurs every two years. So consider applying to YPAA to attend & keep an eye on their facebook page. Thank you to YPAA for nominating me. To Assitej Germany for selecting me and organising the Seminar. To Schnawwl for hosting the conference, and the Ian Potter Foundation for assisting with funds to attend. Thanks for writing such a stimulating post. I’m glad your time at the conference was so worthwhile. What you say about dramaturgy is interesting. I agree, it’s a great space to work in because you can reflect on the smallest moments of a production and the overall shape of it. With so much theatre being made through a devising process, it’s strange that we don’t use dramaturgs more. Although, I have worked as a dramaturg on three shows in the past few years, so maybe it is an idea that is catching on. Although the Australian children’s theatre scene is, as you say, becoming more fragmented, it is interesting that the recent funding issues have galvanised people into some public discussion (including me! : http://theconversation.com/the-fun-and-funding-fears-for-childrens-theatre-in-australia-45950 ) Blogs like yours do a lot to encourage dialogue and questioning of the status quo. So, thank you! Enjoy your walking and thinking. Thanks for sharing your experience and reflections Alex. The common stories across cultures is scary but hopeful at the same time.